Yang, who has spent his entire life living in Seoul, now spends much of his time incorporating his queer identity into his artwork and activism. And while many challenges still exist for the LGBTQ community in South Korea, the story of Yang and his mother may reflect a growing trend toward more acceptance for sexual and gender minorities in the culturally conservative Asian country. Although Yang himself doesn’t like labels, he has learned to embrace the reputation he has built for himself as one of the most visible queer artists in Seoul. In fact, the young artist is literally bringing his latest street performance, ｢Unjustifiable｣, to some of the city’s busiest streets and pedestrian thoroughfares. “I do ｢Unjustifiable｣ to bring awareness of LGBTQ homeless youth, or LGBTQ youth who are in need of help in general,” Yang said. The performance itself isn’t big or splashy. In fact, many times people walk by without even acknowledging him. But in some ways, that’s the point. 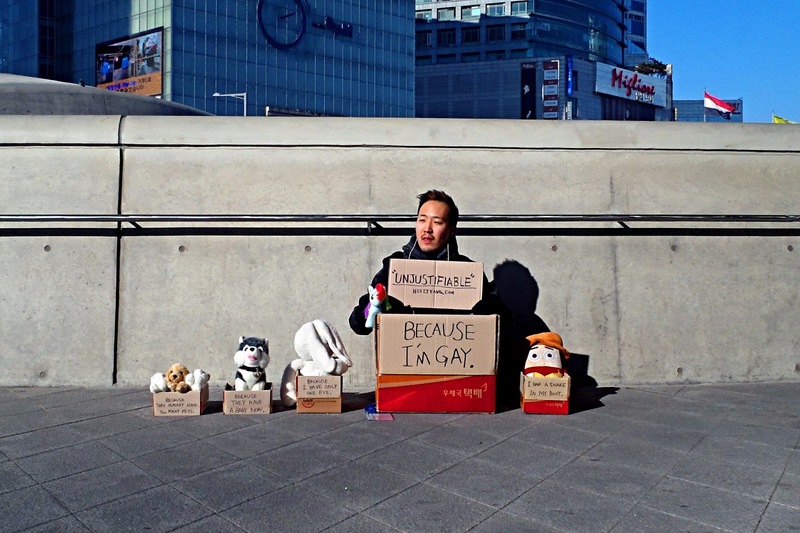 Yang began to get noticed for his performance not only because of the unusual optics of seeing a grown man sitting in a cardboard box surrounded by stuffed animals, but also because identifying as openly gay in such a public setting can still be a challenge for many in South Korea. But Yun said legal and institutional protections for LGBTQ individuals in South Korea are still lacking. As an example, Yun points to the requirement that transgender individuals undergo gender reassignment surgery and sterilization before having their preferred gender legally recognized by the government. Yun also noted that according to South Korean military law, homosexual acts between soldiers are still punishable by up to two years in prison. Yun said that because no education related to sexual and gender minorities exists in schools, discrimination is still prevalent for those coming out in classrooms and work environments across South Korea. As a result, in what is being seen as a growing need to fight this discrimination, support groups like PFLAG Korea are starting to form in the country. Much like PFLAG chapters in the United States, PFLAG Korea serves as a support network and meet-up for parents of LGBTQ children. 닷페이스 .FACE ｢[성소수자 부모모임] 엄마는 널 있는 모습 그대로 사랑한단다｣ - posted on June 11, 2016. Beyond holding monthly meetings, the organization has published a guidebook for parents and participates in a wide range of public events. At the Korean Queer Culture Festival this past June, parents at PFLAG Korea gave out hugs to festival participants for more than three hours. But the organization is hoping that recent trends showing a growing recognition of gender and sexual minorities in South Korea will continue toward more acceptance for the LGBTQ community. They point to a Pew Research Center Poll conducted in 2013, showing South Korea had some of the most significant change when it came to societal views on whether homosexuality should be accepted or rejected by society. PFLAG Korea attributes part of this change to the younger generation of South Koreans who are becoming more open, as well as the emergence of LGBTQ clubs and organizations on college campuses. “The young generation is actively participating in the sexual minority rights movement,” a PFLAG Korea representative said.